I decided to write this article because of what happened to my neighbor’s dog. Yesterday they urgently took him to the vet after he fainted and couldn’t get up on his own. Veterinarian discovered that the stomach of this dog was full of poultry bones. Unfortunately, it was too late to save him. Over the time I had arguments with different dog owners who believe dogs (no matter big or small) are born to gnaw on bones. Some say only raw bones are good for them, some say only the cooked ones. Some argue that they have given bones to their dogs all their life and their parents were doing so as well, and all the dogs were “just fine.” They say it’s in their nature since dogs are descended from wolves. Let me stop that myth about wolves right here. In nature wolves never eat bones. They only eat flesh and leave the bones behind. No wolves eat bones no matter how hungry they are. I wrote this article to show my position to this topic. In my book Russian Toy. Precious Little Paws you can learn more about feeding Russian Toys, which foods are healthy for them and which are strictly prohibited, including what exactly health issues different foods can cause. Bones that are mostly cartilage are good chewing material that can be entirely consumed. Although, I don’t recommend allowing a Russian Toy to eat the whole bone. You can allow them to bite leftover meat from the cow or any other red meat animal bone and eat the cartilage ends but not the bone itself. The rest of it should be thrown away. Such bones as steak, chop, chicken, turkey, lamb leg, fowl, rabbit, pork and of course fish are the most dangerous ones. Dogs’ stomachs are not capable to digest them and it creates a high risk of blockage in the digestive system. Plus, such bones break into sharp splinters which cut and poke through their digestive system. Some situations are even fatal, like it happened with my neighbor’s dog. You might give an adult dog a poultry or a fowl bone occasionally, for example, once a week but only if you cook it for 18-24 hours in a slow cooker or in a pressure cooker until the bones are soft enough to smash with a fork. Do not make it a main course of meal. Bones do not really have enough nutrients for dogs and are pretty useless nutrition wise. Pork bones as any other pork products, including meat, should be absolutely excluded from a Russian Toy diet. When it comes to a teething puppy between four and six months of age it is better to choose a softer rubber toy. Hard bones can damage their bite and break teeth. Rubber toys offer the same advantages without the risk. Learn more about feeding Russian Toys in my book and experience the wonderful world of owning the precious and healthy dog. 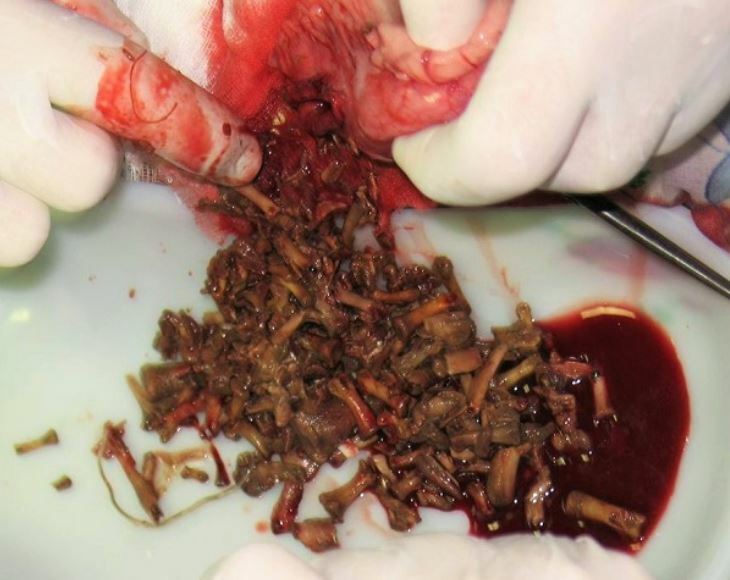 Note: On the photo are bones removed from a dog’s stomach.